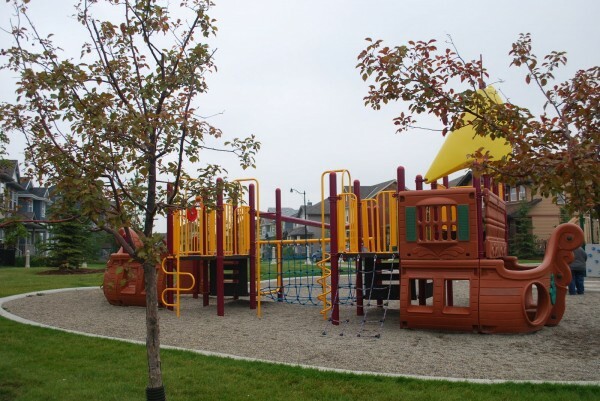 Thanks to Colleen for the great playground suggestion! Gordie’s Review (16 months old) – Wobbly bridges are fun! 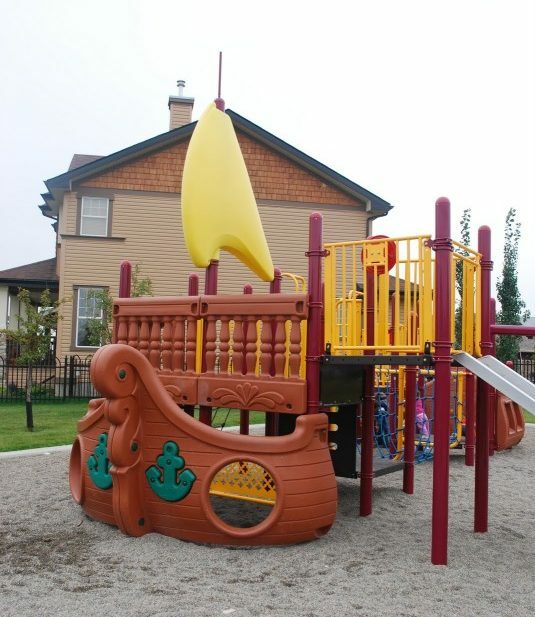 Features: Pirate play structure with 1 slide, a rope bridge/tunnel, treasure maps and a flying fox; Castle play structure with a slide, wobbly bridge, balcony and climbing walls; 2 swings (1 infant). 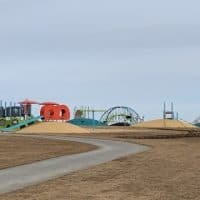 Surrounding Park Area: The playgound is inside a small park with a few young trees, some flat grassy space and a bike path down the centre. Shade: great shade underneath the play structure but little otherwise. The nearby trees will provide more shade as they mature. 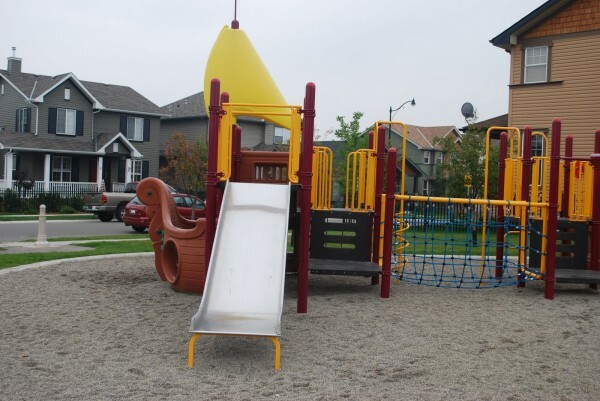 Stroller/wheelchair access: there is a path between the two play structures but no accessibility inside the play area. Overall Assessment: This is a really fun playground. 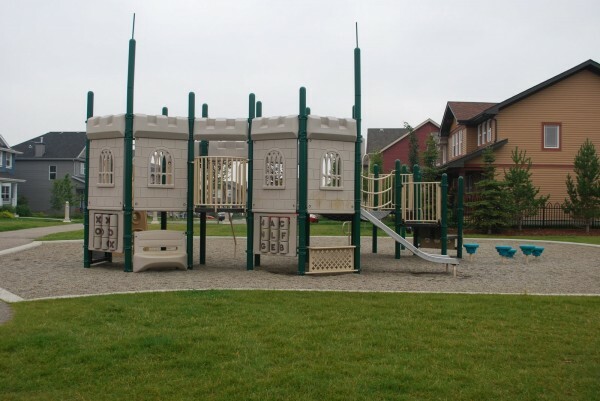 The two themed play structures provide great inspiration and settings for imaginative play. Preschoolers and young school children will definitely be impressed. 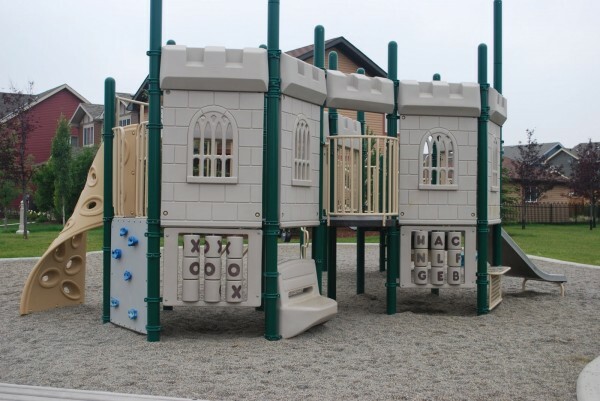 My only real complaint is that the placement of the benches do not allow for a great view of the castle play area. It would definitely be worth a bit of a trip especially if you have a pirate or castle fan. 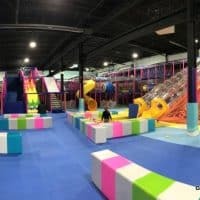 Have you been to this playground? 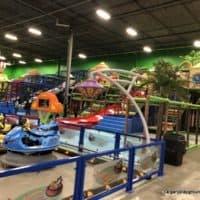 Have a suggestion for a playground review? 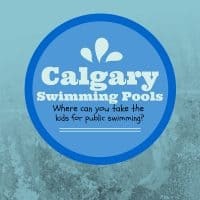 Would you like to write a guest review? Write your thoughts in the comments.